On the evening of Wednesday 19th September 1906 Roland Philipson was travelling home after returning one of his sons to Eton school for the new term. He was, no doubt, looking forward to the following day when he was to attend the launch of the new Cunard liner Mauretania at Wallsend shipyard. Philipson had both personal and business interests in the ship, as a director of the Wallsend Slipway & Engineering Company where the vessel's huge, innovative steam turbine engines were being built. Mauretania was launched as planned on Thursday 20th September 1906 and she became one of the world's most successful passenger liners, but Roland Philipson never made it back to Tyneside to see her take to the water. He boarded the overnight mail train which pulled out of London King's Cross station at 8.45pm. At 11pm the journey ended in disaster at Grantham station, where the train failed to stop as scheduled. It ran through the station at high speed, passed red signals, and derailed on the junction beyond the platforms. The ensuing pileup trapped many passengers. Fires in the wreckage of the wooden-bodied, gaslit coaches resulted in more loss of life, despite heroic rescue efforts by railway staff, emergency services and local residents. There is a photograph of Roland Philipson here (click the photo to enlarge it). Though Roland Philipson perished at Grantham that night, there remain today in the North East reminders of his charitable works. Below there's more information about the searchlight at Tynemouth, and a link to a blog about the Philipson family which appears on the Northumberland Archives website. A searchlight was first installed in the Watch House after a collision between two steamers in the harbour entrance in November 1902. Eight Danish seamen died when their ship Knud sank immediately. The accident happened in darkness and Roland Philipson, a local businessman, thought that the search for survivors might have been more successful if the area could have been illuminated. He paid for an electric searchlight to be installed in the Watch House of the Tynemouth Volunteer Life Brigade (TVLB), which overlooks the mouth of the river, and then for a new room to be added to the South Tower so the light could be mounted higher up. On Boxing Day in 1903 Roland Philipson, Esq. J.P., resident of Tynemouth, presented the life saving searchlight at a gathering at the Watch House, At the age or 40 he was, or would soon become, a director of the North Eastern Railway and of several of the North East's most prominent engineering firms. The original searchlight was badly damaged when bombs were dropped nearby on the Black Middens in a Second World War air raid, so in 1947 a replacement was bought from war surplus stock. It had previously been used by the Royal Navy as a signal projector. This searchlight is still used today for rescues and for training. There's a photograph taken inside the searchlight tower here. Here is an engraved brass plate still to be found on the searchlight's electrical supply . . . 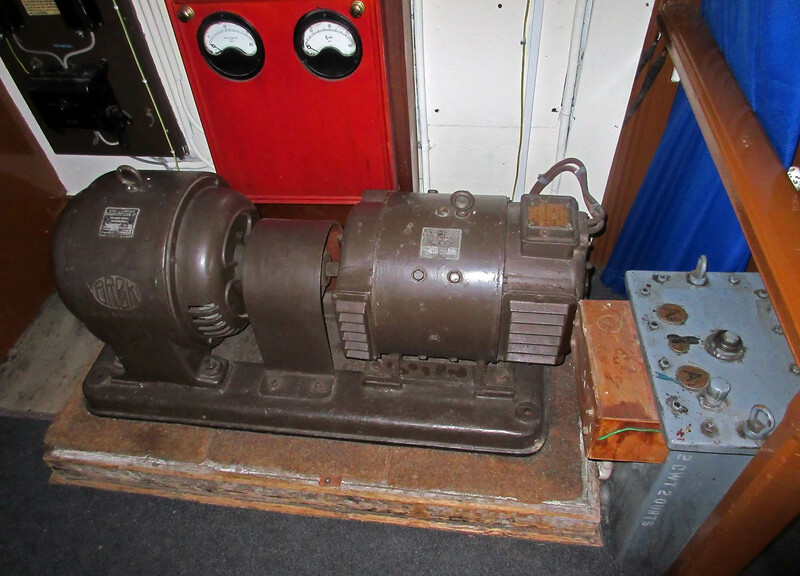 The searchlight motor generator set (a motor, on the left, powered by the AC mains coupled to a DC generator which supplies the searchlight). The engraved brass plate is facing upwards at the right hand end. Who would have thought that there would be a connection between a rescue searchlight still used in Tynemouth today and a victim of the Grantham Railway Disaster? 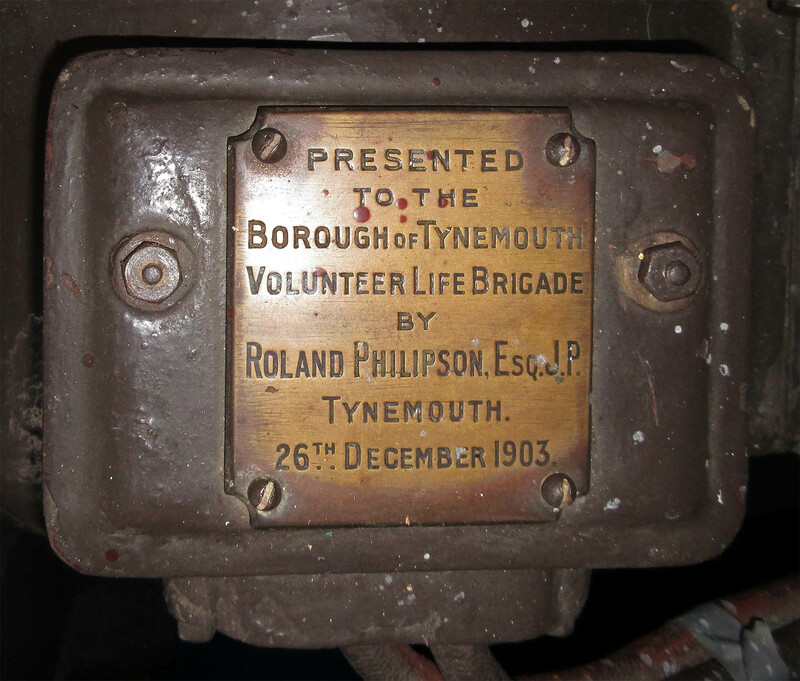 If you're in the area, why not pay a visit to the TVLB's Watch House and museum to see the searchlight for yourself - see The Tynemouth Volunteer Life Brigade website. A year or so after his gift to the TVLB Roland Philipson became the primary benefactor of a movement to provide Tyneside's sick and needy children with health-giving breaks in countryside. He is seated, legs crossed, at the centre of the photograph at bottom right here (click the photo to enlarge it). The photograph was taken at the laying of foundation stones of the Philipson Children's Sanatorium and Farm Colony, Stannington, on 16th September 1905. There is also a short biography of Roland Philipson and a history of the charitable initiatives for children and young people that he supported.